When a football kit manufacturer radically changes the shirt traditionally worn by a club, it has to either (a) have a pretty good reason for doing so, or (b) have exceptional confidence that the new design will be popular. Sometimes, both. Failure to give the fans what they want as a result of not meeting either criteria tends to result in extreme displeasure on the part of the club's followers. It's happened before. 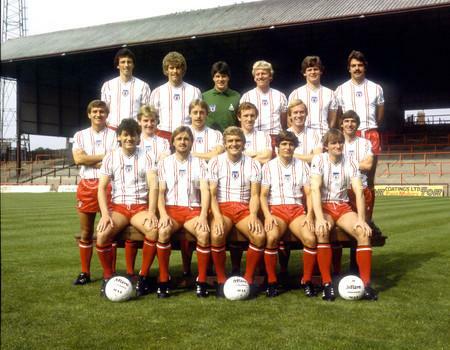 Le Coq Sportif ditched Sunderland's traditional red and white stripes in 1981 in favour of red candy stripes on a white background. Two years later, order was restored, but not before the fans had raged at the brief abandonment of their heritage. More recently, Southampton suffered the same fate when Umbro gave them an all red strip in 2012. To make matters worse, Adidas did the same the following year until finally the red and white stripes were reinstated for the 2014/15 season. Sometimes, however, it's permissible to introduce a one-off kit which, though very different to those that precede and succeed it, is accepted by the majority of fans because of what it represents. Such was the case when Arsenal played out their 2005-2006 season wearing redcurrant-coloured shirts, rather than their bright red shirts with white sleeves. It all came about when Nike produced a design for Arsenal's final season at Highbury Stadium. As part of a concerted effort to look back on the club's history following their move from the Manor Ground in Plumstead, Nike came up with a modern take on the kit worn during their first Highbury season in 1913/14. Photographic evidence showed that The Arsenal wore dark red shirts back then, and dark red shirts were what Thierry Henry, Robert Pires and many others were given to wear by the American sportswear brand. The trouble is, this whole episode seems to be built on a complete misunderstanding. As detailed by Historical Football Kits, the original photograph that inspired the Nike 'redcurrant' design was in fact badly colourised. 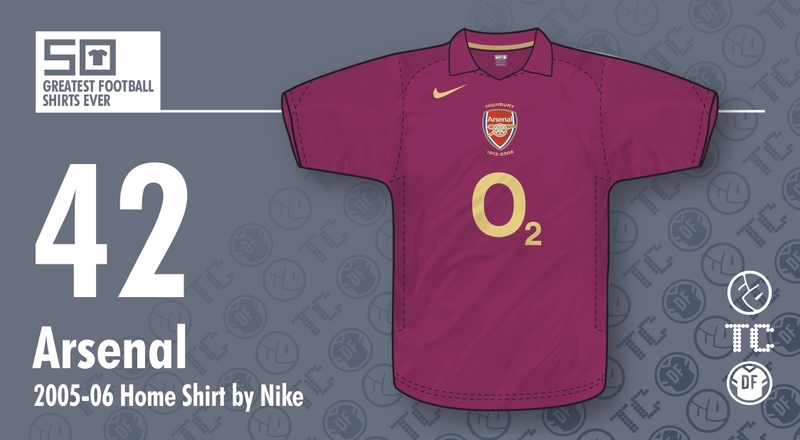 Arsenal's first-choice shirt of 1913 was probably as red as any other worn during their history, but because of the limitations of photographic processing back then, the image took on a false hue that found its way onto Arsenal's Home shirt of 2005/06. Faintly embarrassing as this may now be, one could argue that Arsenal did in fact end up with one of their finest ever shirts as a result of this unfortunate error. The styling is beautifully understated and the proportions and cut of the fabric are virtually perfect. As with any commemorative shirt worth its salt, there are no superfluous motifs or stripes or flashes of any kind. This was a shirt that took good old-fashioned simplicity and shot it through the prism of modern-day chic. 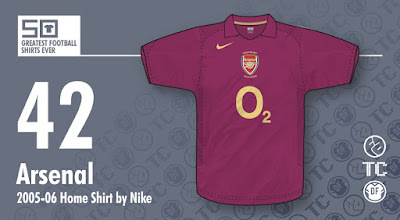 Sporting a modest collar bearing a shallow v-cut below the neckline, the Arsenal badge is located just below it in the middle of the shirt while Nike's 'swoosh' logo appears far away above and to the left in gold print. Almost regrettably as a modern shirt, the sponsor's logo takes centre stage, and it too (or should that be 'O-too'?) is also in gold. Whether this final touch crosses the line of vulgar bling-obsessed self-satisfaction, we'll leave for others to judge, but it's true to say that the gold does work well in contrast to the redcurrant. Just a shame that gold was used to promote a telecommunications company rather than the club's identity. Finally, the reverse of the shirt was reserved for the player's name and number (again in gold) while the words 'Highbury 1913-2006' provided a nice touch in small lettering below. All in all, a very nice shirt and one which, I believe, many fans would have been happy to see for much longer than its tantalisingly brief single-season existence.